The latest restaurant from Kevin Grangier of Le Moo and Village Anchor fame, is a multi-sensory culinary extravaganza in Holiday Manor, cheekily named Grassa Gramma Ristorante Italiana. Nancy Miller pulls up a chair. The stakes and the expectations are high for Grassa Gramma Ristorante Italiano, Kevin Grangier’s newest restaurant venture scheduled to open this month. (In case you’re wondering, loosely translated from Italian, “grassa” means plump; “gramma” means grandma.) Following The Village Anchor, Le Moo and Kevin’s PICNIC, Grassa Gramma is an ambitious project full of jaw-dropping visuals and a menu that melds northern and southern Italian cuisines. Resourcing and transporting interior design elements for the restaurant was an exhausting project for Grangier. “There’s a limited number of Italian pieces of furniture and tapestries and art in our immediate area. 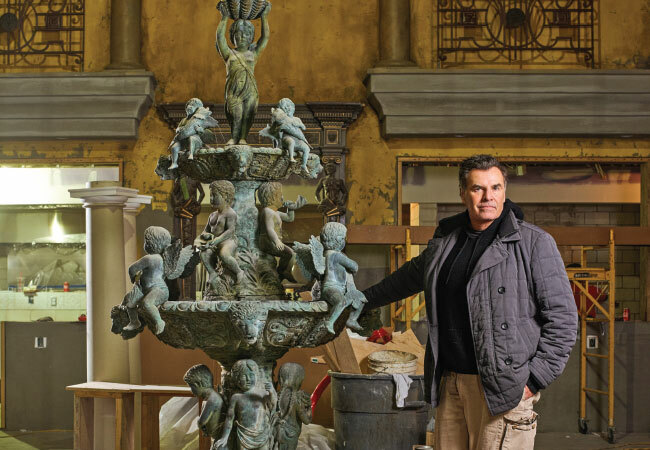 I developed a list of auction houses around the country and in Canada that have a strong history of Italian antiques. I bought many, many pieces, large and small, online,” he says. After he made his purchases, he’d fly to a central area around four or five auction houses, rent a Penske truck, pick up the items and bring them back to Louisville. He made a dozen such trips over a six-month period. What is being used as hostess furniture came from a Gothic Italian castle dining room. The front and back bar, which he calls Confession, were once an 18th century alter from a church that was being torn down. “It’s 22 feet tall and is magnificent. When I saw it, I had to have it,” says Grangier. Thirty clergy chairs from various churches provide some of the most unusual seating in any Louisville restaurant. Piazzas throughout Italy influenced much of the restaurants design. Grassa Gramma’s towering, tiered fountain is meant to emulate Trevi Fountain. Grangier pays special attention to tabletop décor. He was thrilled to find about 350 different plates from an Italian manufacturer that was going out of business. “Just as with the décor of the restaurant, with the menu I don’t want guests to feel as if they’re in any particular city in Italy. That’s why Chef Rob Rice and I worked very hard to create a menu that has the best, most authentic dishes from northern and southern Italy. One section of the menu I would classify as traditional Italian as Americans might portray the dishes. Another part has selections that might be less familiar to Americans. We have tried to cover each end of the spectrum,” says Grangier. He and his team have been diligent about making the experience of Grassa Gramma educational, both through the food and the wines. Finding a grandma to be the “face” of the restaurant became a lighthearted, but essential challenge that resulted in a public competition. “It was really exciting because it put in front of me the various types of personalities a nonna, or an Italian grandmother, represent. But there was only one, Maria Poff, who perfectly fit my stereotype of the grandma. She has an authentic accent, her passion is cooking and she’s very family oriented. The culture she shared with us, her story of how she came to the United States, and her continued connection to her home in Italy all inspired me,” says Grangier. My mom’s getting ready for Christmas was a labor of love that started 30 days in advance. She had five or six trees in various places around the house, a Santa who nodded up and down as he said “Ho Ho Ho” and eight reindeer that moved on the lawn or roof. On the porch was a tree that turned continuously and carolers that swayed back and forth. Do you leave out cookies and milk for Santa? Yes, but because I’m a middle-of-the-night eater, I eat and drink them myself. Because of that, he hasn’t visited me in a while. Are you an eggnog person or do you have a specialty Christmas drink? Definitely eggnog, but with bourbon in it. When I was growing up, my nanny made a grasshopper with crème de menthe and ice cream. Part of my youth was having grasshoppers and homemade fruitcake. Still today I love fruitcake. What’s the most unusual gift you’ve ever given someone? I gave a set of antique Le Creuset from the ´50s to a friend who’s an avid cook. While I thought it was quite unattractive, I thought it was fabulous because it was intact and was almost a piece of art. If Santa and Mrs. Claus were coming to your house for Christmas dinner, what would you serve? Cream of wheat because they’ve been around a long time and likely need to have soft foods. I’d spike it with a little bit of fine Kentucky bourbon and fresh mint. I’d serve it in a nice bowl with a sterling silver spoon and a linen napkin with SC embroidered on it. How do you recover from the after-Christmas blues? I don’t have after-Christmas blues because I’m so happy for it to be over.